Most of us have heard about pool heaters. But actually owning one and installing them at home can be a bit tricky especially if you are a first timer. The solar pool heaters are installed to increase the temperature of the pool with the help of heating panels and the power of the sun. Based on many consumer reports, we have selected the top 5 best solar pool heaters in the market. Smartpool WWS601P is the best solar pool heater for inground pools. The Smartpool brand is well known in making pool accessories. The solar powered pool heater panels made by this brand are very effective. The panels are high in density and weigh a total of 29 pounds. Each box contains a set of two panels each and both the panels are 80 sq ft in diameter. For a decent sized pool, it needs at least three such boxes. The Smart pool solar pool heater has a polypropylene heat collector which heats any inground swimming pool excellently. The panel array is 4 feet by 20 feet in width and length dimensions. The installation kit is sold separately to help with fixing the pool heating panels. Each heater contains 2 solar panels, four rubber connectors which have hose clamps. There are metal tubes approximately 4 inches long which are bent at 90 degrees at one end and there is a screw hole at another end. These panels are having small slots made of plastic near both the edges. These will hold the panels firmly when they are slotted in the roof. It is relatively easy to get the solar panels installed at home. Intex Solar Heater Mat is very competent in collecting the sun’s rays which help in heating above ground swimming pool. 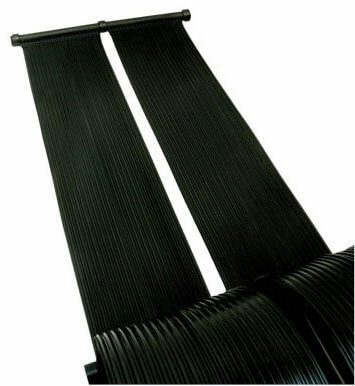 This Solar Heater mat will work with almost all of the Intex filter pumps. The Intex heater helps in warming the water using solar energy which is eco-friendly. By using this heater mat, the temperature of the swimming pool can be increased significantly by 3 degrees to 5 degrees based on the temperatures and weather conditions in the areas. When the sun is stronger we can expect the maximum effect. It does capture weak rays as well proving its efficiency. The above ground pools of 8000 gallons can be easily heated using this mat which is 30,280 liters. The mat has approximately 11 feet of surface to absorb the energy in the form of sun rays. The Intex solar heater mat can be installed very easily as it just needs to be hooked to a pump of 1/2hp. The pump flow rate should be less than 2500 gallons per hour. Attachments include 1 1/4 inch hose attachments and 2 B adaptors with 1 1/2 inch connectors. The GAME 4512 SolarPro XD1 Solar Pool Heater is a good solar pool heater for an above ground pool. This solar heater is pleasing to the eye with its aesthetic looks. Being one of the top-rated heating systems in the market, the GAME 4512 SolarPro pool heater is designed for all the pools above the ground for almost any sized pool. There are no additional adaptors required for this pool heating accessory. The review of this product states that this water heater increases the temperature of the pool water by 5 degrees in around 3 to 8 days based on the size of the pool. This high quality product is very easy to install and there is no wastage of electricity or gas when installing it. The pools of around 8000 gallons of water can be heated by installing this heater mat. There is a by-pass kit that can be used to connect two heaters. This is necessary for larger pools. Smart Pool Sun Heater – Solar Heating System is one of the best solar swimming pool heaters. 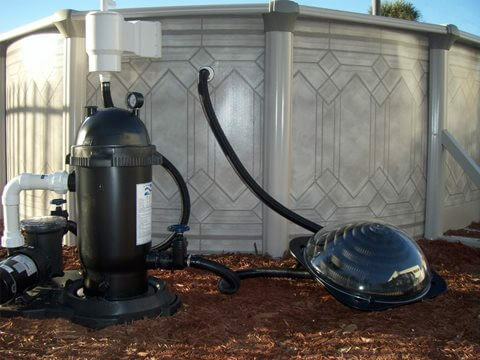 These top-rated pool heaters keep the pool warm by polypropylene heat collector. The solar heaters have two threaded-elbow adapters. The pool heaters are very effective in heating the pools. The pool heater kit has end caps, hose clamps made of stainless steel, Teflon tape and some other hoses for the second collector. The oval pools of dimensions 12 to 24 feet will need one box, the pool of 15 to 30 ft and 16 to 25 ft will require two boxes and 16 to 32 & 18 to 34 ft will require three boxes. The Round Pools of 12 x18 ft will require one box, 21x24 ft will need two boxes and 15x30 and 12x18 ft will require three boxes. Based on the reviews given by customers, the Smart pool heater is available for the best price. 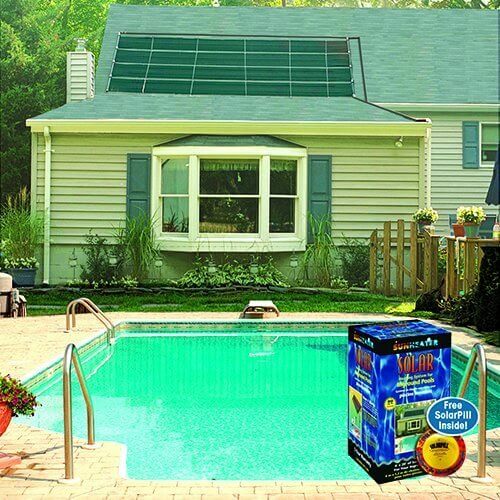 The XtremepowerUS Solar pool panel can be used both inground and in above the ground swimming pools. There are 2 twenty feet long rolls that act as the solar collectors. This is not any cheap swimming pool accessory. This solar heating system can be assembled very quickly and it is ready to use at once. 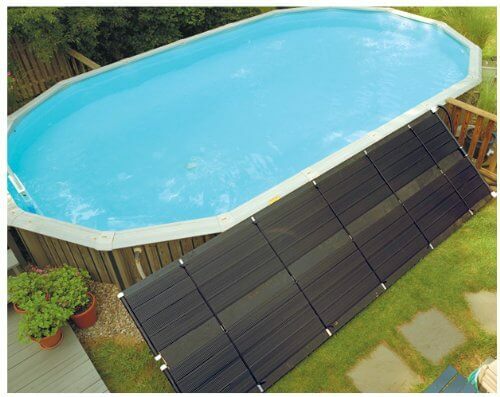 These panels are very effective in capturing the solar energy and heating the pool using that energy. Depending on the size of the pool we can estimate the number of panels necessary for effective heating. For using this pool heater with pumps of 1.5 hp and greater capacity, we must buy the diverter kit. This diverter kit is sold separately. Based on some reviews of this product, customers say that one panel of this XtremepowerUS pool heating system will add up to 8-10 degrees to a 3000-gallon pool.